The NOVUS Glass corporate office and franchising team kicked off their school year by filling over 50 backpacks with school supplies for the Pratt Community Elementary School! 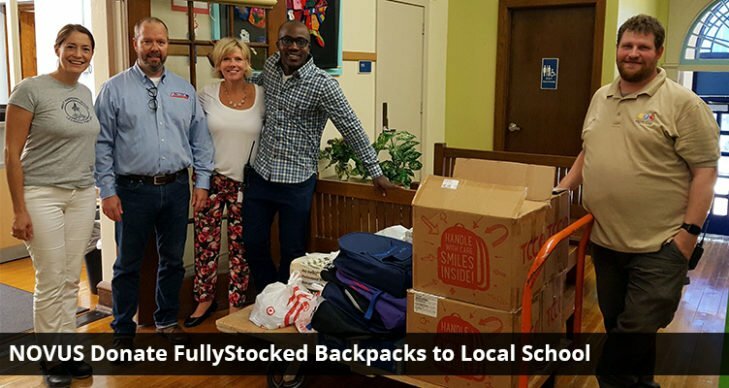 The NOVUS team donated their time and resources, and worked with retailers in the community to secure supplies to fill these backpacks for Pratt students who would have otherwise been without these crucial supplies. School Board Member Jan Peden, Principal Nancy Vaugue, and school Secretary Dekontee Lombel were very excited to have the extra supplies as funding for extra supplies has been reduced this year. Pratt is a 5-minute drive from the NOVUS office, and NOVUS employees were very excited to be involved, spending several hours filling the backpacks with calculators, pencils, markers, crayons, and many other items of need for the students. This year Pratt will have 320 total students, grades K-5. 66% of these students qualify for free or reduced price lunches. Principal Vaugue was very impressed with the quality and quantity of the supplies and are hoping to keep this relationship open for years to come. 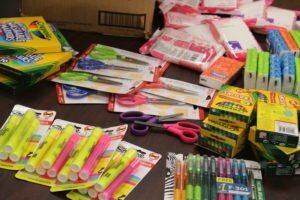 NOVUS hopes to expand the program at the beginning of next school year to include more supplies to more schools. Everyone in the office stepped up to the challenge with their donations and time to help assemble, showing that NOVUS Franchising is more than just a business, but also a community member! NOVUS GLASS invented windshield repair and is the largest auto glass franchise brand in the world. NOVUS GLASS franchisees always Repair First, Replace when Necessary®. For more information about franchise opportunities with NOVUS, call 1 (800) 944-6811 or visit www.novusfranchising.com.